This morning we had a Live trading event using the Atlas Line. 3 Trades were taken all winners. Those of you in the room who grabbed a few points – good job! Don’t forget – there’s less than three days until the At the Open Course is no longer available! Trading the emini sp as a beginner has its advantages because you are starting fresh. I would recommend the mentorship program because it includes everything you need. If you have questions you can always email me and I will be happy to discuss. My name is Hassan would like to learn trading and make a living out of it. 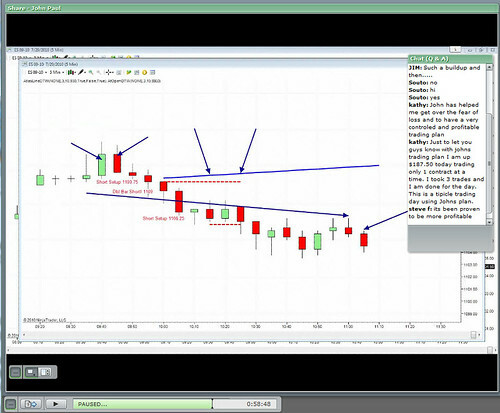 Never trade before, my only experience in daytrading is attending yours and others webinars. seems to me yours is much easier to learn than the others. would you please advise which of your courses is right for me, what type of computer do I need (I already have a laptop, is it ok for trading ?) how fast and how much memory do I need? If ATO course is the one I have to learn, is it possiable to reserve it until next tuseday evening. I am going to be out of state for a few days. I ‘m very interested to learn your method of daytrading. I would appreciate your help in advance.